Guys I say this all the time because it's true... I really do love it when y'all email me! True story I am very invested in y'all's law school success so I take it very seriously trying to help y'all out. I hope you never think twice about emailing me a question because so far I've had an answer to every question (if I don't know I'll find it for ya!) and sometimes even the answer will turn into a blog post. So today I'm offering my thoughts on the low down when it comes to books. TL;DR- rent if you think you won't need to write in your book, buy used when you can. The biggest incentive to buy a new book is that no one has ruined it. I don't use "ruined" lightly here. In law school, it's just the thing that you highlight, underline, and write in the margins of your books. If you get a new book, you get a blank canvas. If it bothers you to deal with other peoples' writing, then this might be the way to go, but honestly new law books are expensive and you easily will be spending over $1,000 on this. But the good news is that you can always just sell your book on Amazon and it will be worth more than selling a used book because it will probably be in better condition and not marked up too much. But there are some things that I really suggest you buy new to keep and that's guides. Some guides that I've kept are abridged statute books. You might need the full statute book with commentary for class (more on that later), but if you don't then these are so cheap that you might as well just buy them. For example, this past summer I brought my book from 1L Civ Pro and was looking up FRCPs for a motion for summary judgment that I was having to draft for a class (this is what I'm talking about).You'll use your BlueBook at some point in every year while you're in law school, especially if you're on a journal, so it's worth the buy (here's a great post on how to use a Bluebook). And if you're in Texas, go ahead and get the GreenBook too. 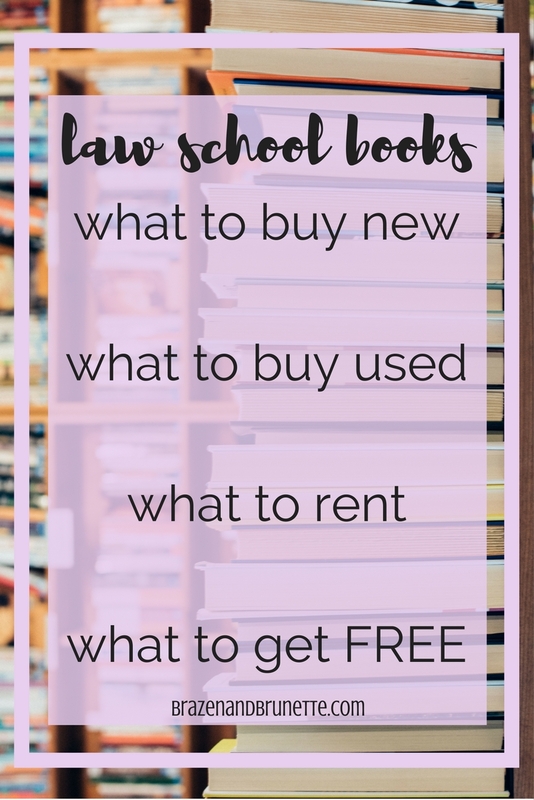 If you're on the fence, I would play it safe (and cheap) and get a used book first and if you don't like having a used book, then next semester you can switch to new. The thing to be careful about is don't go too cheap because generally the cheaper, the worse the writing is. I know this might sound like nbd, but last year I got a book that was really cheap but clearly had multiple owners in the past and the idiots were highlighting on top of each other so literally some parts were highlighted in yellow and purple because they each had their own color system for highlighting. But if you choose carefully, then you might end up with the just-right amount of highlighting. I got a book last year that someone had put their color system on the inside cover (very handy) and so then I could just read through the case and already know like oh hey there's the rule right there and it made things a lot easier and faster. I always prefer to buy used from Amazon because I get free shipping as a student and I can choose between buying used-like-new or used-acceptable. Renting is another great option because it's so cheap! But remember what I said— cheap comes at a cost. While some places will allow you a little writing in the books, a lot of places are picky and if you write/highlight in the books then you'll be forced to buy it back at new price (even if you didn't get it new). The worst part is the amount of writing/highlighting they'll allow is up to the discretion of whoever happens to be in charge of accepting your book that day. I had a friend rent a casebook and then a week into the semester decided she just wanted full rein on marking up her book and just went to town on it and when she tried to buy it back from them, she ended up paying more than what a new book cost because they charged her fees for having to get a new book! 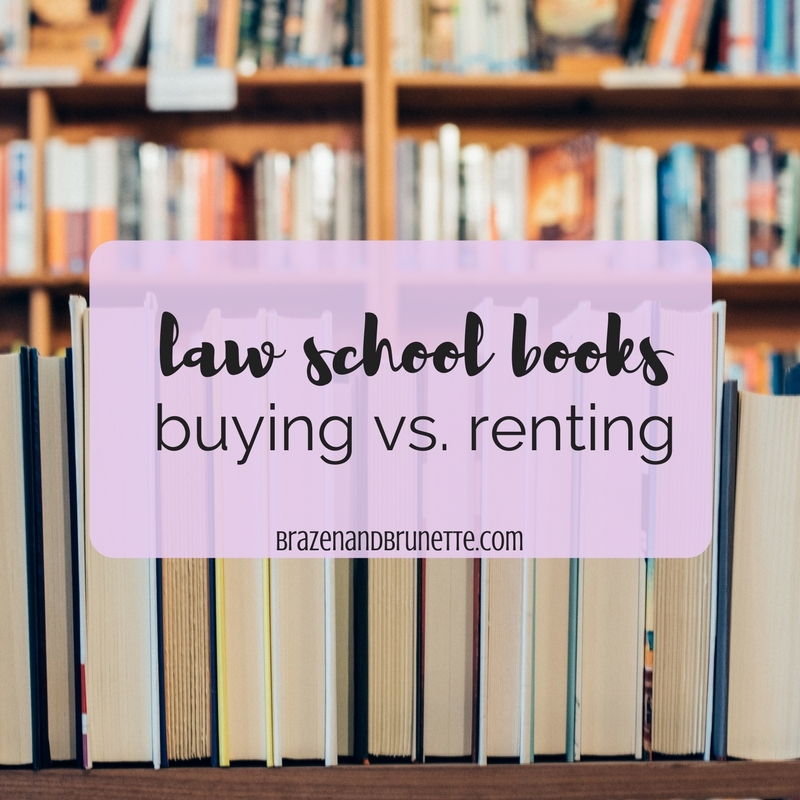 I don't personally recommend renting casebooks, but that doesn't mean I'm anti-renting. What I do suggest you look into renting are statute books. 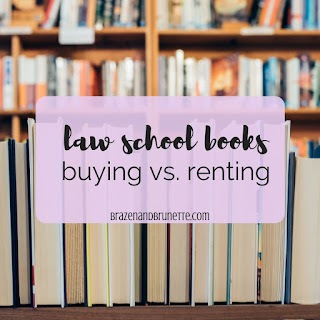 I always just rent mine because these books are updated constantly due to new case laws or legislation being passed so most likely by the time you're practicing, a section or two in your book is outdated. I always just reason with myself that I'll have more money when I'm an actual lawyer to buy this. Plus, it's kinda pointless to have the family law statute book when you want to be a personal injury lawyer. Pro tip: if your professor allows you to bring your statute book in to your final, you can just use removable tabs to mark the big pages and just underline the main parts of the statute in pencil. Buy a jumbo eraser at the end of the semester and then you should be able to revert the book back to looking unused and should be good to go! Another thing that I always rent is supplements (here's a post explaining what a supplement is). If you get an E&E or Crunch Time to help you study last minute, then just rent it and you can return it after the semester because you'll never need it again. One warning that I learned the hard way is go ahead and rent it now because by time midterms/finals come around, they're going to be scarce and extra-expensive. I always love to rent through Chegg because they send you little freebies with your order and I've never had a problem with them requiring the books be due before finals (law school finals tend to be more spread out and finish later than undergrad finals so this can be a problem when renting from a local bookstore). If your school pays for you to use WestLaw (you'll sign up for it at orientation), there's no need to buy or rent Black's Law Dictionary! And if you need the UCC for Contracts (and later Commercial Law/Secured Transactions), you can get that here for free, too! My Commercial professor would let us use our laptops in class and I would just have this pulled up. Then when it came time for our open-book final, I just went to our law library and checked out the hardcopy to bring in to my final. Other free codebooks: Federal Internal Revenue Code, Federal Rules of Civil Procedure, and Federal Rules of Evidence! Hope this helps! 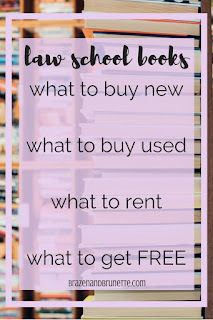 If you're still nervous about getting ready for your first day of law school, then check out my posts 21 must-have supplies for law school and 7 things to do before law school. Oh and obviously email me if you still have any questions!! This article gave me a good inside on how things work at your law School or law school in the US in General. Where I come from, renting textbooks is not an option, it just isn't offered. I usually buy textbooks (new, because highlighting in textbooks drives me crazy) or borrow them from the library if I know that I won't need it again or it is just a supplemental etc. Unfortunately textbooks are very expensive, though luckily it seems not as expensive as in the US. This year and a half is going to be expensive again. It will cost me about 900$ to buy all the neccessary books.